While I am more than thrilled to share this blood orange salmon fillet and ginger garlic stir fry I have a funny story to tell you first! Two years ago I was working on a whole salmon fillet recipe (very similar to today’s blood orange salmon fillet!) with a fresh spring salad. 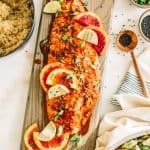 The client had requested the salmon be wild, caught and bought from Whole Foods. Which basically meant I was spending a good $30 on a fillet of salmon, but it’s okay! You gotta do what you gotta do sometimes. I set up the first process shot to show how to make the marinade for the whole salmon fillet and I realized that I needed a fresh camera battery. I leave the room for just under ten seconds and turn around to find my entire $30 salmon filet shoved between Rascals jaw. I don’t think I had ever seen him so happy. I was equal parts angry and hysterically laughing. I meant his shenanigans had to have been equivalent to me sitting in the 10th row at the Taylor Swift concert to Rascal having this salmon filet in his mouth. Who am I to take that kind of joy away?! I told him to drop it and my luscious salmon fillet flopped onto the carpet. I rinsed it off and baked it as is. I saved it and put a little in Rascals food each day. There was no way that I was going throw that gorgeous piece of fish away. To this day every time I break out a whole salmon fillet, I can’t help but think of baby Rascal on his glory day. This time he watched from afar and I keep my photography set up quite a bit higher. Nonetheless, it still turned out delicious! This time of year go through a real big ‘blood orange’ phase. Sort of like when your whole shoe wardrobe becomes sandals in the summer, all my citrus turns into blood oranges. They’re gorgeous okay?! I can’t help it. 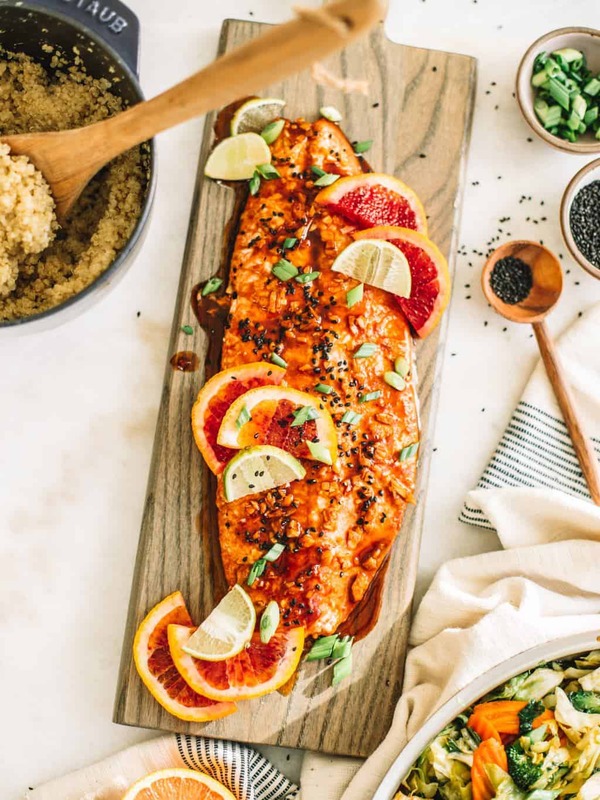 Shake up your weeknight dinner this week with an easy blood orange salmon and ginger garlic stir-fry. For easy weeknight dinners, I love making a really tasty protein like Greek chicken skewers or herbed turkey burgers and serving them up with a semi-homemade side. 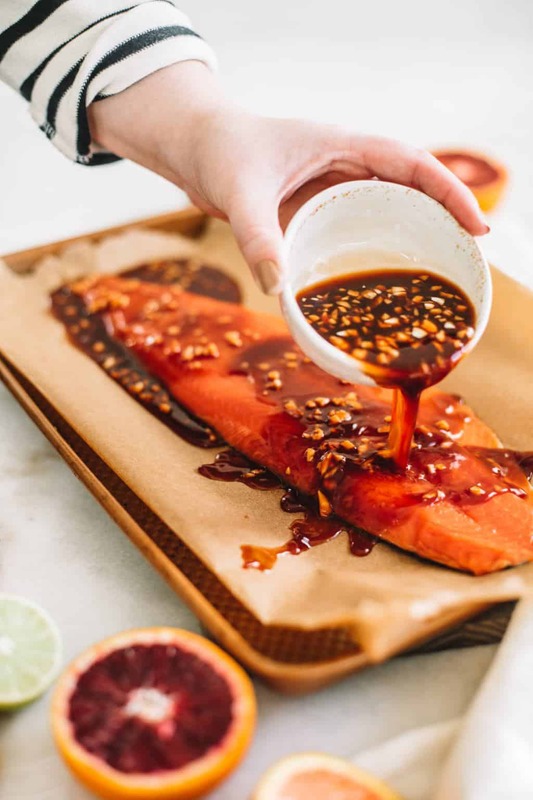 The marinade for this blood orange salmon fillet is made with mostly pantry staples, just be sure to pick up some blood oranges and fresh ginger on your weekly grocery shop. Whisk all the ingredients together in a small bowl and bake for 15-20 minutes or until light and flaky. 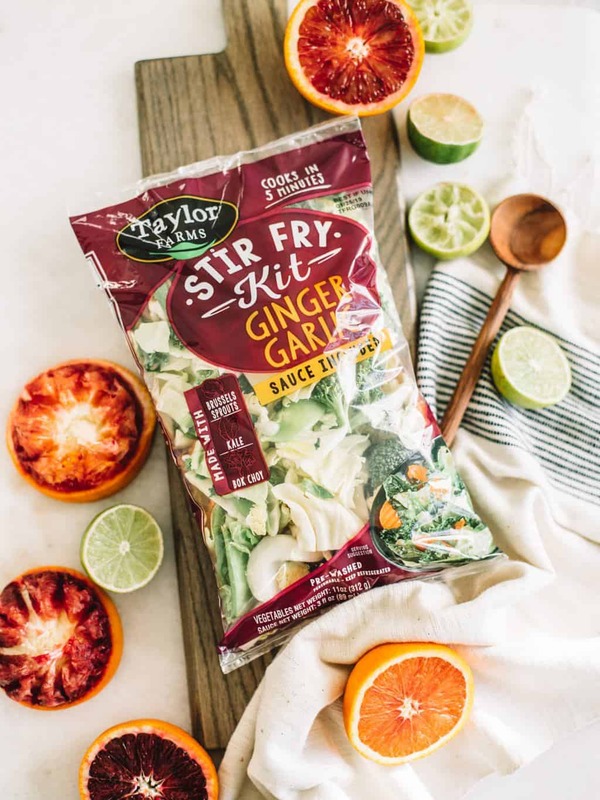 You really can’t go wrong with this weeknight staple! Baked Cod with Braised White Wine Heirloom Tomatoes– Simple flavors but restaurant quality! Asian Ginger Garlic Sheet Pan Salmon & Veggies– What I always make when we want something with Asian flavors! Blackened Cod Fish Tacos with Sriracha Lime Crema– Two words: Taco Tuesday. Golden Corn & Quinoa Mexican Caesar Salad– This and a strong marg and I’m sorted on any night! 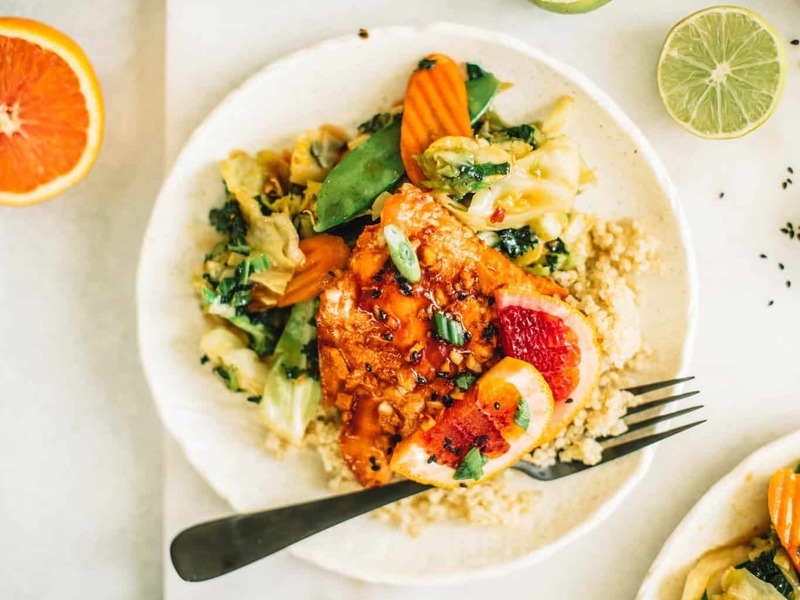 Your next weeknight dinner needs to be this blood orange salmon fillet with an easy ginger garlic stir fry. This is a tasy, flavorful and healthy recipe!